Former Great Britain international Jamie Thackray, who lists Leeds as one of his former clubs, is set to miss out on a return to Headingley in tomorrow's Ladbrokes Challenge Cup fifth round tie. Leeds-born Thackray spent over two seasons at Headingley and had been looking forward to going back there after the Dons were paired with the high-flying Super League side prior to being sent off in the big defeat against Toronto. The RFL disciplinary committee meet tonight to determine his fate, with the most likely outcome a two or three-game ban. “Although we’ve made no secret of the fact that the league is our top priority, we want to go there (Headingley) and give a good account of ourselves on the night,” he said. Although the odds are stacked against the Dons, Thackray says the fact that it will be Rhinos’ third game in nine days could help to redress the balance. “I’m not sure what sort of side they’ll play against us – they could decide to rest a few players,” said Thackray, who helped Hull FC beat Leeds in the 2005 final. “But they’ve got such strength in depth that whoever they play it is going to be tough for us. “As I say, the league is our priority and judging by the way Toronto have started I think the rest of the division is chasing the remaining promotion spot via the play-offs. “You’d expect the likes of Barrow (last season’s beaten play-off finalists) to be up there challenging and hopefully we will be as well. “We’ve got them to play at home and that’s obviously going to be an important game in not only qualifying for the Super 8s but finishing as high as possible. 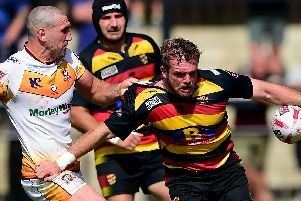 The 37-year-old had planned to retire last year after spending the season with Ealing-based Championship side London Broncos. But he was persuaded by head coach Gary Thornton to delay hanging up his boots and so far he has no regrets. “The club approached me and I decided to give it one last season and I’m enjoying it here,” he said. “Hopefully I can help Doncaster get where they want to be.